Three siblings who have been displaced from London because of WWII are sent to live in a more rural part of the country. They are re-homed with a woman who turns out to be a witch and is looking for a specific spell to help the war effort. War, witches, and toe-tapping jingle jangle songs. That's what you can expect in the family adventure musical "Bedknobs and Broomsticks." It is directed Robert Stevenson, who was a go-to director for many live-action Disney classics like "Old Yeller," "Darby O'Gill and the Little People," "The Absent-Minded Professor," "The Love Bug," and "Mary Poppins," just to name a few. The screenplay is written by Bill Walsh and Don DaGradi and is adapted from the books "The Magic Bedknob" and "Bonfire and Broomsticks" by Mary Norton. It stars Angela Lansbury as Eglantine Price, a woman who lives by herself out in the country and is learning witchcraft through a correspondence course from Professor Emelius Browne (David Tomlison). With World War II in full swing, many children from the city are being displaced, and Miss Price has reluctantly accepted three siblings, Charlie (Ian Weighill), Carrie (Cindy O'Callaghan), and Paul (Roy Snart), into her home. Miss Price has been hoping to receive a spell that will help with the war effort, but when it doesn't arrive, she takes the children on an adventure to track it down. This is a fun and magical adventure that may be closely equated to "Mary Poppins." It has the same kind of look and the same kind of feel, right down to a mid-film animated sequence. This makes more sense when you realize not only are both titles from Disney, they are also both from the same writers and directors. In that aspect, you could call this a little formulaic. Angela Lansbury herself said that her performance was constrained by the by-the-numbers approach Stevenson and Disney took in creating this film. That being said, we still feel like there is enough different stuff here to offer up a good, worthwhile viewing experience. Most the music is enjoyable and catchy, though, like most musicals, there is an act two dance sequence that carries on for far too long. The sequence starts with the song "Portobello Road" (one of the better numbers in the movie) until it carries on four and half minutes more with its associated and unnecessary dance number. Of course, this may be limited to the reconstruction cut which is about 20 minutes longer than the theatrical version. To us, it seems a bit unnecessary for the story that's being told here. The performances are solid, the music is good, and we love the final showdown that puts Miss Price and her magic against a recon group of Nazi soldiers in one of the most Disney-friendly war scenes imaginable. 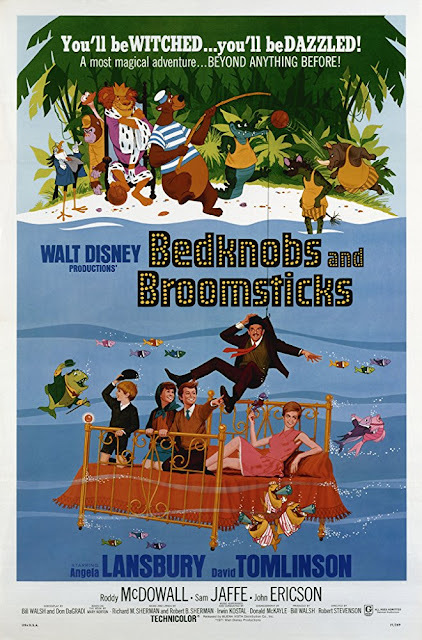 "Bedknobs and Broomsticks" may not be as iconic as "Mary Poppins," but it still provides a fun experience for viewers young and old.